Kala U BASS BLACK JOURNEYMAN MAHOGANY UBASS with Gig Bag – New! Now available in Matte Black Stain with Kala Round Wound Strings! The Journeyman is the grandest UBass in the new line up, made of Mahogany with white binding, f-holes, and a cutaway. The Journeyman is a great for gigging, has the original UBass tone, and it wonât break the bank. 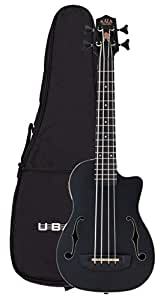 Hone your skills and perfect your craft, this UBass is made to take you as far as you want to go. The Journeyman will set you on your way to becoming a master.